Delta Force Paintball in Melbourne. When it comes to outdoor entertainment there is no other choice than Delta Force Dingley! Our Melbourne Paintball centre will have you ducking and weaving through our amazing movie-set props as you attempt to pass through the pyramid or reach the USAF aircraft. With many game zones new to Australian shores, our world-class paintball facilities have been a refreshing boost to the Melbourne paintball scene. We pride ourselves on our professionalism, quality and customer satisfaction and you can rest assured that a day with us will be one to remember. Our impressive paintball centre is located only 30 minutes from Melbourne CBD and is easily accessible from a range of transport options. Whether you’re organising a birthday party, buck’s or hens celebration, corporate outing or just a group of mates wanting to shoot it out, come and experience paintball the Delta Force way. Bring your friends for a full day of paintball action with the best paintball centre in Melbourne. You won’t be disappointed! 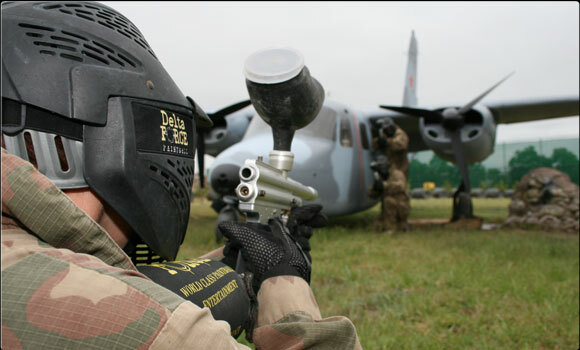 Delta Force Paintball operates in Australia, the UK, Ireland, New Zealand, Canada. We are the largest paintball company in the world and are committed to providing you with the ultimate paintball experience! We have been operating for more than 25 years and our movie-set game zones have entertained more than 5 million paintball enthusiasts. We have entertained countless amounts of movie and TV stars, royalty, world-class sporting teams and musicians. We treat all our guests like celebrities – so round up the troops and get prepared for the most action-packed adventure you’ll have on dry land. Book an experience with Delta Force Paintball and you can rest assured knowing that you are playing with the world leader in paintball entertainment!